At its customer event The Future of Business Printing in Vienna, Epson announced its mission to replace laser printers with inkjet printers. The company now claims its latest WorkForce Pro printer ranges have the capacity and reliability to support a vastly greater number of page impressions between refills than previously available. 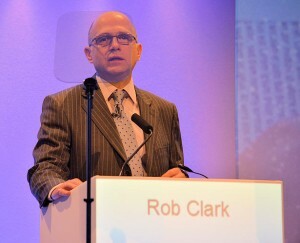 Epson EMEAR vice president for marketing Rob Clark (pictured) and his team unveiled the five “completely new” inkjet printer ranges which use large ink reservoirs in the form of replaceable bags rather than cartridges. Clark claimed this allows print runs of up to 75,000 pages before a refill is needed – dependent on the nature of the printing involved. The consumable element of the printers is the Replaceable Ink Pack System (Rips) which is based on four-colour printing (one bag for each colour). The bags look similar to the inserts found in bag-in-a-box party packs of wine. 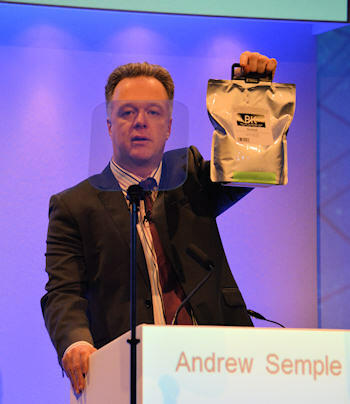 They have been designed to make them easy to replace, much cleaner and simpler than replenishing a laser printer – in fact, at the event, a randomly selected journalist was invited to replace one of the bags and did so without any difficulty in a matter of seconds. The printer ranges cover A3 and A4 paper sizes and fall into two basic operational environments: the WorkForce Pro 3000, 4600 and 7000 series target the various needs of smaller workplaces, while the 5600 and 8000 series cover departments which have a greater throughput or for centralised, shared print resources. Across the ranges, there are 15 models in all but they share a new print engine based on the more robust PrecisionCore ink printer engines used in Epson’s industrial-class fabric and label printers. The hardware also appears to use much less power than laser equivalents. 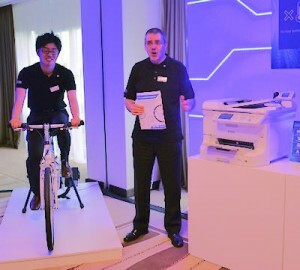 An Epson demonstration in Vienna linked an exercise bicycle to a generator to power one of the new printers. A page was printed with the demonstrator cycling at around 11 miles per hour (18km/h) and Epson calculated that to power a laser printer would require the cyclist to pedal at 60 miles per hour (100km/h) – which could not be demonstrated. 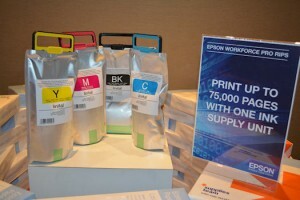 The business printers will only be available through Epson’s channel and prices were not announced. Clark told ChannelBiz that the company will allow the partners to work out their own customer contracts but this hints at a hiring system rather than an outright hardware sale backed by an ongoing consumables replacement proposition. Clark said printer prices may be revealed but the cost of each Rips pack will not. Unfortunately, the printers were revealed to the press a day before the channel partners arrived, so no further pricing and contract deal information will be available for the time being.